Hack/Slash is a comic book movie adaptation from Relativity Media that’s been on the way for a couple of years now. It was originally set up to be directed by Todd Lincoln but, as with most properties that sit around for an extended period of time, the movie now has a new director: Fredrik Bond. The new director is another in a line of newcomers who are best known for their TV and music video work. Bond must be impressing people with his non-cinematic works, as he’s also been tapped to helm the remake of popular foreign monster movie The Host, and a remake of The Hunger for Ridley and Tony Scott’s Scott Free Productions. 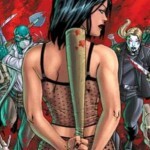 Hack/Slash is a comic that follows Cassie Hack, a victim of a monster attack. After she survives the attack, she vows vengeance on monsters everywhere and sets off to put them down one-by-one — including some rather well-known horror movie monsters! Of course, she’s not alone: a giant, disfigured man named Vlad who dons a gas mask and wields two meat cleavers stands by her side on this quest. I’m someone who is not familiar with the comic itself, but just the premise alone (especially if some sweet horror movie killer cameos show up) is something that has my attention and could win me over. Because of this, Hack/Slash has a chance to be a really successful movie, even with those who don’t know the source material.